Family matinee, Feb. 2, 1 p.m. This is a story about Penny. Penny is a small bird. She is purple and she likes being fast, especially when dodging raindrops. Penny has a big flock of bird friends, called the Jolly Troop. These birds have a very important job: They help critically-ill children tell a story, and ultimately write a book, about their fears, joys and loves. All of the Jolly Troop birds are characters from the Red Fred Project, started in 2013 by Dallas Graham to give kids living with serious illnesses a voice. Over the last five years, each of these characters has been featured in various child-authored storybooks. Recently, however, these characters have caught the attention—and sparked the imagination—of adults. In 2016, the Red Fred Project teamed up with the Salt Lake Acting Co. and Flying Bobcat Theatrical Laboratory to translate the book Climbing With Tigers—a story by Nathan Glad, a child living with brittle bone disease—into a theatrical performance. Now Graham's birds, led by Penny, are teaming up with Ririe-Woodbury Dance Co. for an all-ages friendly performance, The Live Creature & Ethereal Things. From the ground up—music, costumes, story and choreography—everything about The Live Creature & Ethereal Things will be entirely original, with each part crafted by local artists and musicians. The original musical score comes from John Paul Hayward, a composer and performer with the Utah Chamber Artists and the Utah Symphony. Costumes are by fashion designer Jared Gold. And while the characters and the inspiration come from the Red Fred Project, the choreography is entirely new work from Ririe-Woodbury's artistic director Daniel Charon, with theatrical guidance from Flying Bobcat's Alexandra Harbold and Robert Scott Smith (Smith will also appear in the performance). Assembling such a diverse team has been years in the making. "I met Graham when I moved to Utah five and a half years ago," Charon recalls. "Right away I knew there existed in Red Fred the potential for a joint project some day with Ririe-Woodbury." That idea was rekindled for Charon, in 2016, when he attended a performance of Climbing With Tigers. Delighted by the production, Charon decided to reach out. "Dallas and I met again about a year and a half or two years ago, to finally discuss a collaboration. Even then, I didn't know what it meant. I didn't know if we would adapt a book for the stage, or how exactly we would use his characters and ideas." 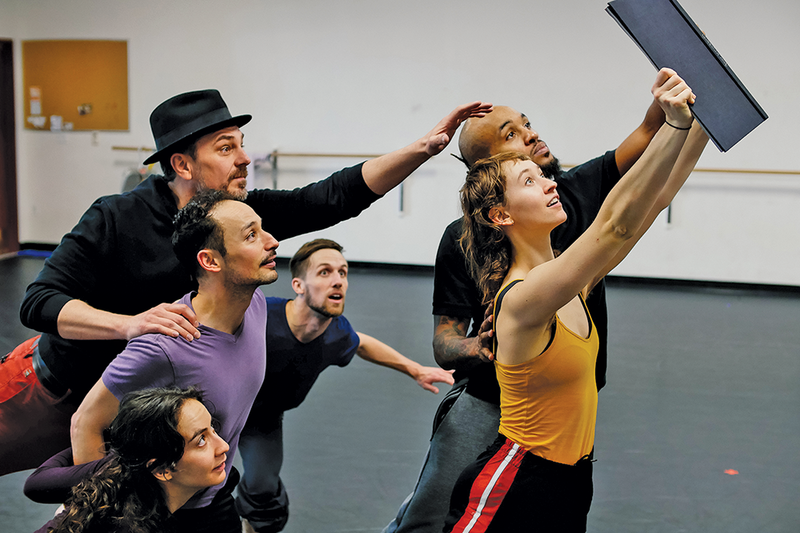 Since joining Ririe-Woodbury as artistic director in 2008, Charon has continued to choreograph his own works for the company with surprising regularity (Elegy, 2016; Snowmelt, 2017; the Alone Together trilogy). Charon's work often addresses complex, mature concepts, but for The Live Creature & Ethereal Things, Charon was tasked with creating a work that would also appeal to children. The project was daunting, but with Graham's help Charon was able to pull together his artistic crew—a rare and elaborate creative collaboration that signals a new level of artistic maturity for Salt Lake City. The first piece of the creative puzzle came from Flying Bobcat Theatrical Laboratory. "I've been friends with Dallas for a very long time," Robert Scott Smith of Flying Bobcat says. "We worked together before on Climbing With Tigers, and the birds really resonated with us. So if Dallas asks us to do something, we are there." An additional selling point for Smith and his colleague Harbold was working with dancers. "I was over the moon," Smith says. "We both felt it was a windfall of great luck since our company has been very interested in exploring movement." The actors worked closely with Charon and the Ririe-Woodbury dancers throughout the project. While developing his Jolly Troop, Graham created small bios for each of his birds, giving them unique personalities. Having worked so closely with Graham on other Red Fred projects, Smith says that he and Harbold understood the nuances of each character. The Live Creature & Ethereal Things is a dance performance, so the birds don't speak, but the goal was to create recognizable characters simply through movement—like a silent movie, or a picture book with no words. Together, Charon, the dancers and the acting team developed a movement language that could express each character's individuality. And in the end, it was little Penny that stood out the most. "The children who write the Red Fred books can pick any character they want from the troop to tell the story," Harbold explains. "Penny became our trooper. It changed the whole thing when we noticed that was happening. Fred has always been the leader of the troop, and they all have strong personalities, but in this story she is the one that goes through a transformation."